Republic of Ireland boss Giovanni Trapattoni has released five senior players for Tuesday night's friendly against Uruguay at the Aviva Stadium. 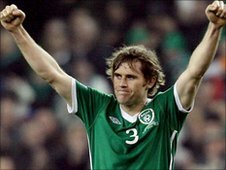 Skipper Robbie Keane, Kevin Kilbane, Richard Dunne, Damien Duff and the injured Kevin Doyle all played in Saturday's 2-1 win against Macedonia. Trapattoni has not called up attacking replacements despite the absence of Doyle and Keane. However, Anthony Stokes and Cillian Sheridan are on stand-by. Trapattoni's option up front are limited - Leon Best was injured earlier in the week and with Jon Walters is unavailable after the birth of his son.